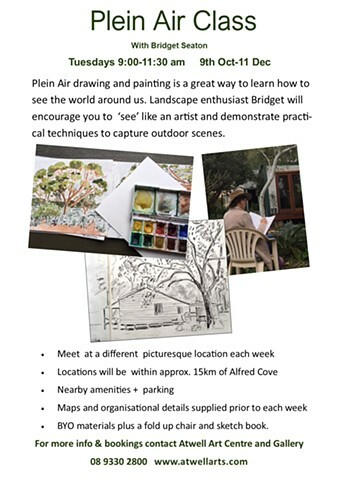 Plein air drawing and painting is a great way to learn how to see the world around us. It teaches us how to 'see'. Demonstrations will be given on practical techniques to capture what we see through sketching and simple watercolour painting. We will explore aspects such as: light, perspective, texture, focus and importantly; how to 'see' like an artist. Each week we will meet at a different picturesque location in Perth with nearby amenities and accessible parking and shade wherever possible. The locations will be within 15km from Alfred Cove and will often encompass views of the river.